As you’ll come to see in this article, I really struggled while reviewing this suitcase. Look, when it all comes down to basics, this is a rather average option. It has great 360-swivel wheels, you can pull it behind you or push it in front of you, it comes in a rainbow of awesome color options, and it has interior storage that will make your heart smile. But it’s made from ABS, not polycarbonate, which poses the question: Do you prefer something extremely lightweight or something very durable? You are going to need to be able to answer that question to make this decision. Whether you want a carry-on or a full-sized suitcase (or both), you won’t be let down by the Kenneth Cole Reaction Out of Bounds model. You can get it in a 20-inch or a 28-inch case. The 20-inch is perfectly acceptable as a carry-on bag and will fit neatly into an overhead compartment on an airplane or even a train. The 28-inch option is great for those long trips when you need to pack a LOT of things, or shared trips when you don’t want to bother with multiple pieces of luggage for multiple people. It is unfortunate, though, that it doesn’t come in a mid-size, around the 24 or 25-inch mark, like some of its competitors. Oh, I am such a sucker for bold colors. I love to be different. I love all my things to be different from other people’s things (sure makes ’em easier to find). Now, if you’re like me you will be very happy to hear that of the incredible 9 color options you have to choose from, a few are quite bright and bold. One is bright, nearly fuchsia pink. One is a nice bold purple color. A deep, royal red is also available. Those of you who like to be different but don’t feel a need to attract too much attention to yourselves will love the more subdued color options like rose gold or the shimmering navy blue or silver. If you prefer something more traditional you will be happy to see that there are also basic color options like cobalt blue, black, and charcoal. Want to carry clothes and shoes in here but don’t want your shoes to mess up your clothes? No worries. Pop your clothes into the open side and strap them down with the clip strap, then zip open the U-shaped flap on the other side and slip your shoes in. Or, use these two sides to separate your clean clothes from your dirty ones. Why does this work so well? The flap between the two sides is a full piece of material instead of a flimsy piece of mesh that dirt and scents can easily penetrate. I brag a lot about the polycarbonate suitcases on this website and they truly are my personal favorite, but what’s ABS? In case you’re wondering, yes, this is an ABS case – it has an ABS outer casing. Like polycarbonate, ABS is a synthetic material that was made to take things a step up from the heavier hard case options like metal and plastic. ABS is a very lightweight material, even lighter than polycarbonate. Why do I prefer the polycarbonate option, then? Because it is more durable and can take a bigger beating during my inevitably difficult travels. But if weight is more important than durability for your own travels, you may want to consider this suitcase. The light weight of this case also allows you to carry things that are heavy without tipping the airport scales. Think about it, the heavier your suitcase is on its own, the fewer things you can place inside of it without going overweight and paying that hefty overweight fine (or, even worse, having to throw away some belongings to get on the airplane). At only about 6 pounds 7 ounces, this suitcase weighs much less than many of its hardshell and softshell competitors. So, what’s your decision? Does this suitcase live up to your needs in terms of function? It should – I wouldn’t have put it on this website if it didn’t already rise above the average in some way. But is it made of the right material for you? If you are someone who routinely carries heavy, fragile equipment around, it’s time to stop thinking and just get on over to Amazon to check this thing out further. 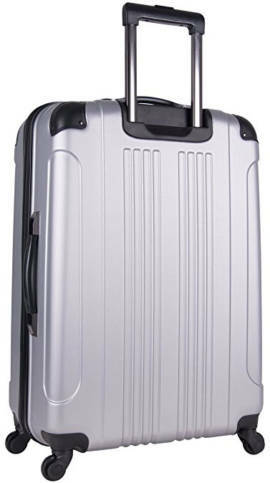 If, however, you generally pack lightweight things like clothing and are more worried about your suitcase getting dinged or cracked, you may want to look at a polycarbonate option.